Financial literacy can be hard to teach. That's because numbers on a page don't feel real. With our society's increasing dependence on credit cards, it's more important than ever to help students "feel" the realness of their own money. Any effective financial literacy lesson needs to be hands on. Why Does Money Not "Feel Real" to So Many? For some reason, using credit cards causes us to buy more junk food. And studies have shown that the more transparent our spending (cash versus credit), the less we're likely to spend. As I teach accounting, for example, I find that debits and credits alone don't excite my students. But when I have them use debits and credits to keep track of their assets, profits, and losses while playing Monopoly, they care about accounting for every penny. As the money changes hands between them, they feel how each dollar is something very real. They may be using play money, but the tactile experience of having it move through their fingers makes the financial concepts stick. And that is what we want, isn't it? At Westwood Schools, my fellow teachers Andrea Stargel and Jill Pollock have a genius way of teaching how to count money. It starts with each student bringing a dozen baked goods to school. 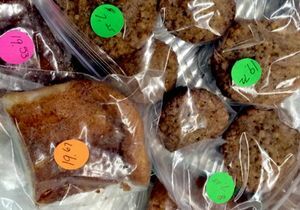 The teachers have prepared colored price tags, and when the students arrive with the baked goods, the teachers attach a tag to each package. The prices range from two or three dollars to $50 or more. But don't worry -- no one is spending real money on these high-ticket items. The teachers have a whole set of play money, but the transactions will have very real consequences. For the counting change simulation, students each get a $100 bill of play money. They may select three snacks for up to $100. They take the snacks to the register and must add and count change for their purchases. They count it for each other, and they count it for themselves. They practice for the first few hours of the day. Then the real sale starts. Now that they have practiced counting money, all the treats go back on the table. The fifth grade class starts selling their goodies to the rest of the school at just 50 cents a bag. Now they're counting money for real as they sell their wares under the watchful eye of their teacher. At the end of the day, they count their class earnings and celebrate. This creative lesson has students practice with many denominations of money, finally leveling up to real money. How Can You Teach Financial Literacy in Your School? There are many ways that you can help students become more financially literate, and you don’t need to have them bring their own money to do it. Look for activities and events that give you a chance to "buy" and "sell." Let students be entrepreneurs. Let them manage their sales, and teach them the process of accountability. In three weeks, I will have four National Honor Society students counting out the money for our school's poinsettia sale. For each package, they'll be using a double-counting process that I teach them so that we account for every dime. Experiences like this help money become real. And with an increasing dependence on credit and debit cards, the more real that money can become, the more we're setting up our students for a financially literate -- and financially secure -- future. As teachers, our job is to look for these experiences and help students become more involved with money in age-appropriate and allowed ways in our schools. It's their future, and they're counting on us.